Langham Hotel London. Two literary guests were hosted over dinner here by an American editor in 1889: Oscar Wilde and Arthur Conan Doyle. What happened when Oscar Wilde and Arthur Conan Doyle met over dinner? If only the walls could talk. "You will find me at the Langham, under the name of the Count Von Kramm." 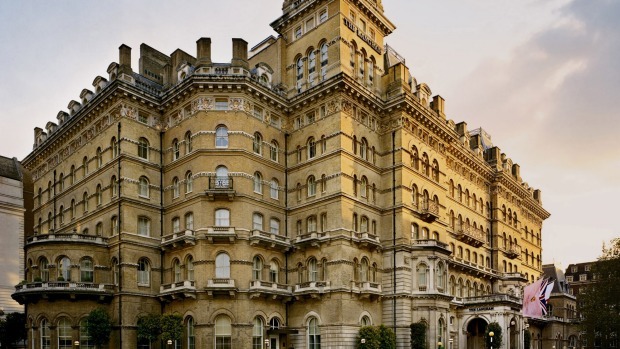 Like the disguised King of Bohemia in the Sherlock Holmes short story A Scandal in Bohemia, I've installed myself at the elegant Langham Hotel. A short walk from Oxford Street, its imposing facade has been welcoming London visitors since 1865: including Mark Twain, Winston Churchill, Noel Coward and our own Don Bradman. I'm more interested in two literary guests who were hosted over dinner here by an American editor in 1889: Oscar Wilde and Arthur Conan Doyle. The meal gave birth to two great novels, Wilde's The Picture of Dorian Gray and the second Holmes story, The Sign of Four. The dining room where they met is still a restaurant, nowadays the classy Roux at the Landau. But I'm bypassing its pleasures and hitting the streets on the trail of the Great Detective. It's 125 years since the first collection of Holmes short stories was published, and I'm seeking sites connected with the master sleuth. "This is where it all kicks off," says Chris Taylor, of Brit Movie Tours, as we stand outside the former Criterion Restaurant off Piccadilly Circus. Nowadays it's an upmarket Italian eatery, but there's still a plaque commemorating the epochal meeting here between Doctor John Watson and his medical colleague Stamford, which led to Watson moving into 221B Baker Street with Sherlock Holmes. While we're at this busy intersection, Taylor flips open a folder of photos showing how elements of the Sherlock Holmes movies with Robert Downey Junior were shot here with the aid of CGI, and how the BBC TV series Sherlock used a different angle for a scene of its own. Swinging into the courtyard of Burlington House, the only surviving mansion along Piccadilly, we admire its 18th century architecture. Its grand exterior stood in for an opera house in the 1979 movie Murder by Decree, which drew Holmes across the trail of Jack the Ripper. In addition, one of the learned societies housed here, the Royal Society of Chemistry, granted Holmes an honorary membership in 2002 for his work in forensic science. Good going for a fictional character. As we trace a convoluted path through posh establishment London, Taylor points out more landmarks with a Holmes link. There's the former residence of Prime Minister Gladstone, who Conan Doyle disguised as Lord Bellinger in a Holmes story; the private library the author was once a member of; Waterloo Place, whose stairs were ridden down by Holmes aboard a motorcycle in Sherlock; and Trafalgar Square, used for filming in both Sherlock and the US series Elementary. Then we're into theatrical London, weaving past a statue of Oscar Wilde, the original premises of the Strand Magazine, which published the short stories, and the Lyceum Theatre, which staged a crucial early Holmes play starring American actor William Gillette. It was this production that made famous those Holmes trademarks that barely appeared in print: the deerstalker hat, and the Calabash pipe. At Waterloo Bridge, Taylor shows us images of scenes from an episode of Sherlock, which was shot on the muddy bank of the Thames below. Finally, we end up in the beautiful courtyard of Somerset House, part of which was used to depict the eccentric Diogenes Club in the 1970 movie The Private Life of Sherlock Holmes. An odd film, says Chris, but its exploration of Holmes' mental state was a great inspiration to the later Sherlock TV series – bringing us full circle to the present. Another day, another Holmes walk, though this time I'm focusing on the Sherlock who originally appeared in print. "This is a walk about how Sherlock Holmes became the phenomenon he is today," says guide Richard Burnip, of London Walks, as we gather in light drizzle outside Embankment Tube station. Walking through the adjacent gardens into Buckingham Street, Burnip points out an address where Arthur Conan Doyle lived in 1903. By chance, it had been quite a literary hotspot, having previously accommodated Pepys, Coleridge and Dickens. With his medical background, Conan Doyle was familiar with the nearby Charing Cross Hospital and used it as a plot point in The Hound of the Baskervilles, wherein Watson wrongly deduces the initials CCH on a mislaid walking stick as standing for a country hunt. Passing the Adelphi Theatre, our guide tells us about the historical play Conan Doyle staged here in 1909, whose run was cut short by the death of King Edward VII. After the funeral, he attempted to make good his losses by staging a new Holmes play featuring a snake. The real pythons hired by the playwright were denounced as lifeless fakes by a critic, so a rubber stand-in was then used, to great success. As we pass, Burnip points out Simpson's in the Strand, the restaurant founded in 1828 that was mentioned in two Holmes stories. At Covent Garden, we hear about the time Holmes tricked a merchant here into letting him know the supplier of a goose that had laid a stolen gem; and pause outside St Paul's Church, favoured by actors. We end at the Sherlock Holmes pub, tucked away in a quiet street near Trafalgar Square. Upstairs is the replica of Holmes' sitting room created for the Festival of Britain in 1951, preserved behind glass. It feels good to sit next to it, and drink a toast to the Great Detective's memory. In all my visits to London I've never visited Madame Tussauds, dismissing it as a tourist trap. But as it now has a dedicated Sherlock Holmes Experience among its famous waxworks, I've decided to give it a go. It turns out to be a lot of fun, with visitors allowed to get up close to the moulded celebrity likenesses to take selfies. My first Holmes encounter here is in the form of Benedict Cumberbatch, the actor who portrays the detective in Sherlock; or, more precisely, his wax doppelganger. Then I locate the Sherlock Holmes Experience, with its separate admission fee, and am welcomed into a Victorian-era residence by an actor playing Mrs Hudson. Holmes' landlady tells us we're to aid Doctor Watson in solving the sleuth's mysterious disappearance. What follows is a cartoony but fun adventure as we progress from docks to a morgue to impressively vibrating train carriages, amassing clues until we finally catch up with Holmes. The resolution to the story is a damp squib – the crisis being more of a misunderstanding by Watson than anything else – but it's an amusing escapade just the same. Not far away, by the entrance to Baker Street Tube station, stands a lofty statue of Holmes in cape and deerstalker. Scanning a QR code at its base allows onlookers to access an audio recording, in which the statue talks about its appearance and location. Even in the 21st century, it seems, Holmes is still with us. In this uncertain era dominated by emotional populists, I suspect we yearn for a cool-headed reasoner to help us find our way. That's elementary. Several London restaurants which appeared in Sherlock Holmes stories on page and screen are still serving customers. Here's the solution to their whereabouts. Speedy's Cafe. In the BBC TV series Sherlock, Holmes and Watson live above this classic London "caff" (though it's not really located on Baker Street). It serves builders and locals with strong tea and straightforward cafe food, though you can ask for the off-menu Sherlock Wrap. 187 North Gower St. The Langham London, langhamhotels.com. Classy hotel imbued with history. From £350 a night. Ibis London Blackfriars, ibis.com. Comfortable accommodation near Southwark Tube station. From £109 a night.